Styling a great outfit for work can be a challenge, especially if you are returning from a long and relaxing weekend. Whether your workplace offers a casual or professional environment, setting the intention to find a trendy and polished wear-to-work outfit is key to making it through the week with ease. In this blog post, we’re sharing our top wear-to-work style suggestions. Keep on reading if you’re looking for a bit of style inspiration for your work wardrobe! 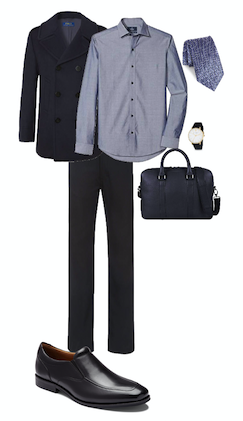 Keep your professional attire sheek with this classic outfit. Whether you find yourself sitting at your desk or heading to a meeting, this look is simple yet versatile and will fit any occasion you might encounter during your day. 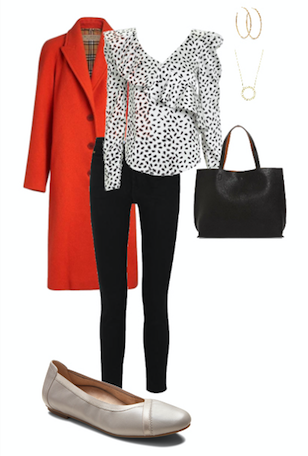 To achieve this everyday work style, you will need black skinny jeans, a simple long sleeve blouse, some gold earrings, a gold necklace, a medium sized black tote, and a red coat to keep you warm. You will also want to find some work shoes that will help keep your feet well-supported throughout your work day, similar to our Carroll Ballet Flat. Embrace the smart professional in you with this office appropriate style. A pop of color is always fun when you are picking out your wear to work style. You can wear this stylish look any day and feel confident as you go from meeting to meeting. 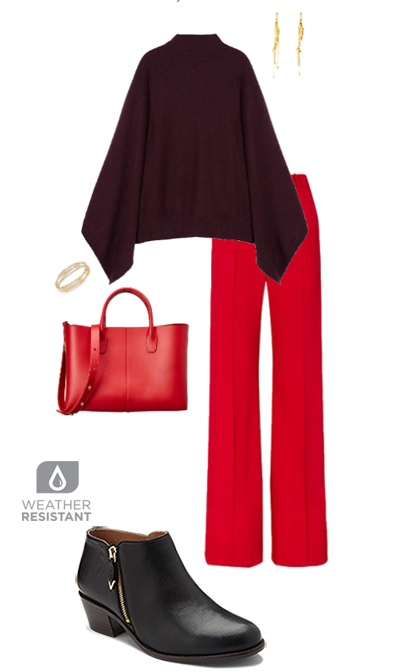 To achieve this bold, fashion-forward look, you’ll need a pair of wide-leg slacks, a dark colored poncho, gold earrings, a gold bracelet, a red purse, and some comfortable shoes to keep your feet well-supported, such as our Jolene Bootie. Be casual yet professional with this simple style. Just because you are heading to work doesn’t mean you can’t sport your favourite business casual attire. 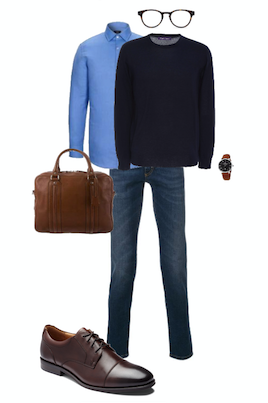 This simple yet casual wear-to-work look has the professional appeal but the casual look. You can go from work to home and wear this outfit at any time. To achieve this work look, you’ll need a dark pair of jeans, a light blue dress shirt, a navy sweater, glasses, a brown watch, a brown briefcase, and of course, comfortable dress shoes to get you through your day, such as our Shane Lace Up. Keep your work style professional with this classic look. Keeping your wear-to-work style simple yet professional isn’t a bad thing. In fact, you can make dressing for work look stylish any day of the week. Whether you’re in your office kitchen grabbing a cup of coffee or working on your next project at your desk, this look is perfect. To achieve this business professional look, you’ll need a dark pair of slacks, a light grey dress shirt, a blue patterned tie, a black watch, a black briefcase, a navy blue coat, and some supportive dress shoes, similar to our Sullivan Slip On.